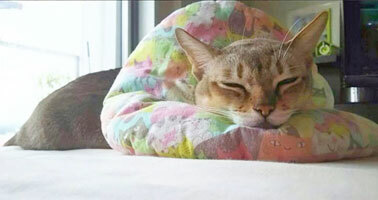 In 2012, our cat had eye disease and the vet doctor give her eye drops and a classical cone collar. She was so fine and was just prohibited to scratch the eye. But the collar made her much stress. She could not eat and drink well then she was getting weak. 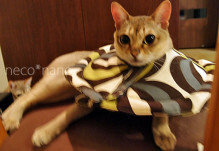 So we made a collar to help her that was the first model. 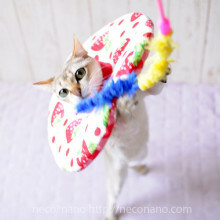 The first model was meliorated classic cone collar that was made from cotton cloth not plastic and it was difficult to fit to her neck. 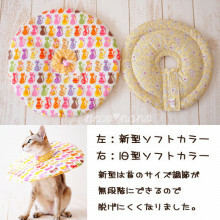 The cone shape made from cloth gave her narrow sight that was not better than we thought. 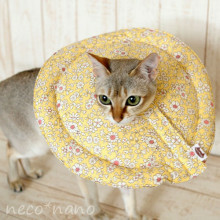 Next, we had observed her to know which points cats don’t like the classic cone collar. Then we made the second model that has wide sight. But we did not solved the fitting problem on the first model yet. After that we made models again and again. 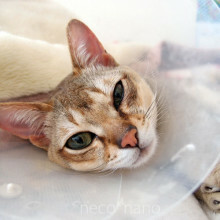 Then neco*nano™ collar has made and we have continued the development for cats.